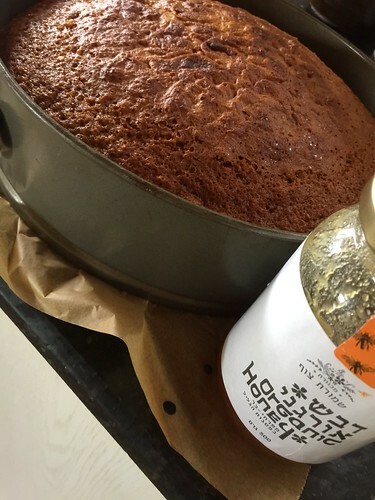 When visiting my dad in Montreal I overheard him and a friend talk about his two wonderful family recipes for honey cake. Not having been raised with my father, and knowing very little about his side of the family - I couldn't pass on the opportunity to connect to my paternal ancenstors via culinary traditions. One of them was from a friend of my grandma and seems a bit too tricky to make. The other, which I'm sharing here, seems very authentic and has even more honey than my Savta Ruthie's recipe which I grew up on. It is very moist, and having less spices (and no cloves at all - fathom that!) it has a definitive honey flavour, which is a good thing. Honey is a strong flavour when added to more delicate things; but can easily get lost in a recipe such as cakes and cookies. It has very little oil, and is immensely moist and with a long shelf life. It is wonderful accompaniment to either tea or coffee. And also makes a very big cake, that you can cut into squares and share with family and friends as a gift - simply wrap in a wax paper and tie with a bow. Alternately add the tea blend and the dry ingredients to the honey blend. Mix well. Add the nuts and dried fruit and the orange juice. Place in a a round spinrgform pan lined with a baking sheet (or in a large rectangle pan) and bake for about an hour or until a toothpick inserted into the cake comes out clean. Keeps well but if you don't think you can eat it within a week, keep it refrigerated.